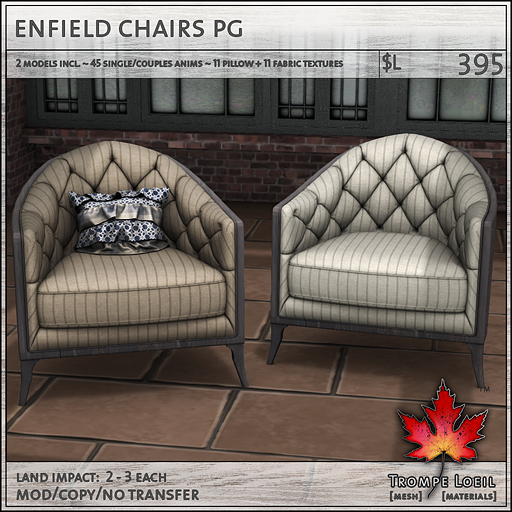 Throw open the windows and let in the spring air – and freshen up your look with on-point pinstripes, stylish neutrals, and classic tufted tailoring, in Trompe Loeil’s new Enfield Living Room Set, only at FaMESHed for April! 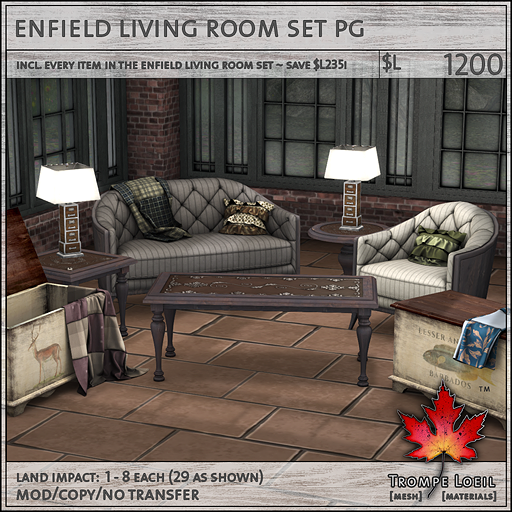 The Enfield set is centered around the matching Chair and Couch – both have multiple models (pillows and blankets), 11 pinstriped fabric colors, 11 pillow/blanket fabrics, and your choice of PG or Adult animations. Timeless pieces that make a refined statement in any room! 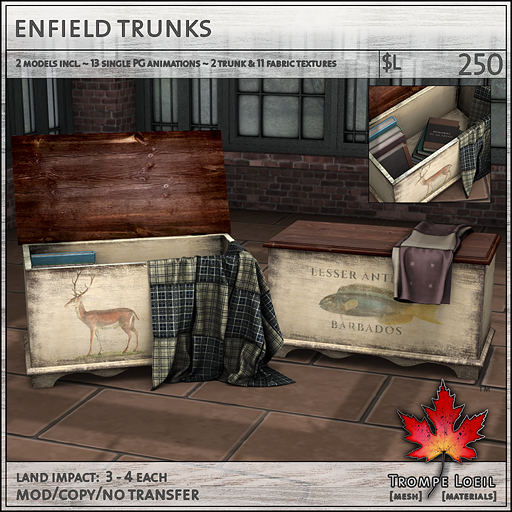 Our Enfield Trunks are worn, attractive and functional – the Open version has a texture-change draped blanket and stacked books inside, and the Closed version has a folded copy of the same texture-change blanket plus fun PG single animations for use as an extra seat! We’ve included both, each with two graphics. 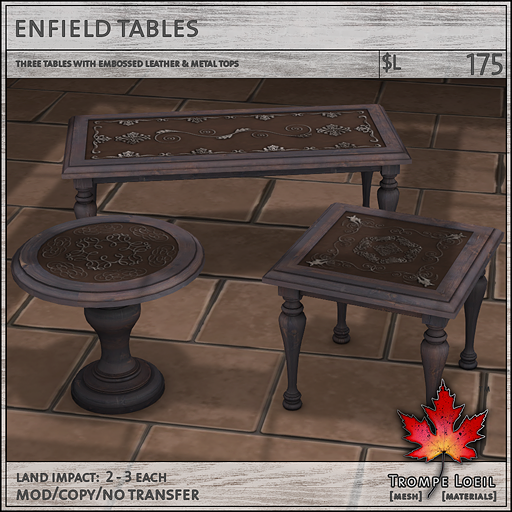 Embossed leathertop tables are next on the list – we’ve included three shapes and sizes for any corner of any room. 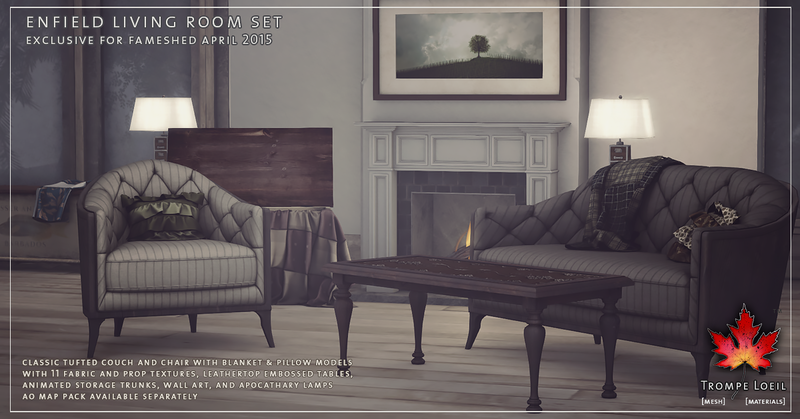 Made with materials for a realistic look under changing lighting conditions! Need a light to read by? 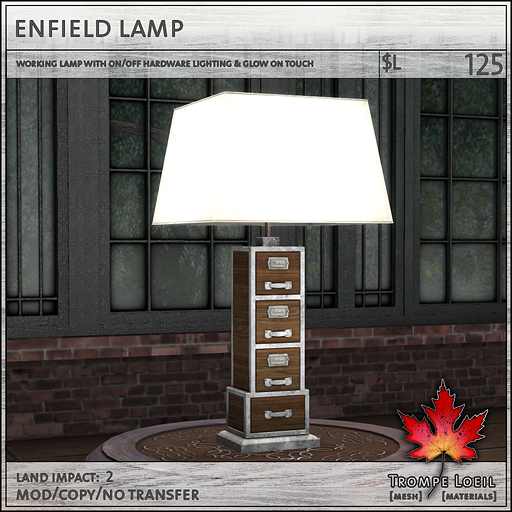 The Enfield Lamp has a retro apothecary style and working on/off hardware lighting for a perfect glow. 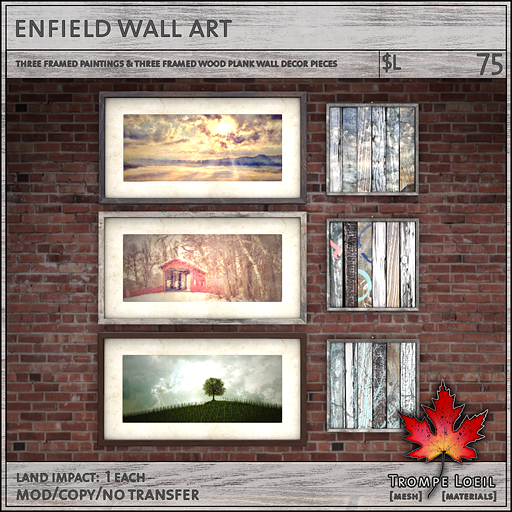 Add our Enfield Wall Art for a finishing touch. Framed and ready to be hung, we’ve included three gorgeous oil paintings and three wood collages for mixing and matching. Love it all? Get it at a discount – the Enfield Living Room Sets include every piece shown, at a savings!